And check out the classroom. Does Junior’s learning style match the new teacher’s approach? Or the school’s philosophy? Maybe the child isn’t “a good fit” for the school. Such theories have developed in part because of sketchy education research that doesn’t offer clear guidance. 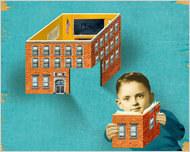 Student traits and teaching styles surely interact; so do personalities and at-home rules. The trouble is, no one can predict how. But individual learning is another matter, and psychologists have discovered that some of the most hallowed advice on study habits is flat wrong. For instance, many study skills courses insist that students find a specific place, a study room or a quiet corner of the library, to take their work. The research finds just the opposite. In one classic 1978 experiment, psychologists found that college students who studied a list of 40 vocabulary words in two different rooms — one windowless and cluttered, the other modern, with a view on a courtyard — did far better on a test than students who studied the words twice, in the same room. Later studies have confirmed the finding, for a variety of topics. The advantages of this approach to studying can be striking, in some topic areas. In a study recently posted online by the journal Applied Cognitive Psychology, Doug Rohrer and Kelli Taylor of the University of South Florida taught a group of fourth graders four equations, each to calculate a different dimension of a prism. Half of the children learned by studying repeated examples of one equation, say, calculating the number of prism faces when given the number of sides at the base, then moving on to the next type of calculation, studying repeated examples of that. The other half studied mixed problem sets, which included examples all four types of calculations grouped together. Both groups solved sample problems along the way, as they studied. A day later, the researchers gave all of the students a test on the material, presenting new problems of the same type. The children who had studied mixed sets did twice as well as the others, outscoring them 77 percent to 38 percent. The researchers have found the same in experiments involving adults and younger children. These findings extend well beyond math, even to aesthetic intuitive learning. In an experiment published last month in the journal Psychology and Aging, researchers found that college students and adults of retirement age were better able to distinguish the painting styles of 12 unfamiliar artists after viewing mixed collections (assortments, including works from all 12) than after viewing a dozen works from one artist, all together, then moving on to the next painter. The finding undermines the common assumption that intensive immersion is the best way to really master a particular genre, or type of creative work, said Nate Kornell, a psychologist at Williams College and the lead author of the study. “What seems to be happening in this case is that the brain is picking up deeper patterns when seeing assortments of paintings; it’s picking up what’s similar and what’s different about them,” often subconsciously. Cognitive scientists do not deny that honest-to-goodness cramming can lead to a better grade on a given exam. But hurriedly jam-packing a brain is akin to speed-packing a cheap suitcase, as most students quickly learn — it holds its new load for a while, then most everything falls out. When the neural suitcase is packed carefully and gradually, it holds its contents for far, far longer. An hour of study tonight, an hour on the weekend, another session a week from now: such so-called spacing improves later recall, without requiring students to put in more overall study effort or pay more attention, dozens of studies have found. No one knows for sure why. It may be that the brain, when it revisits material at a later time, has to relearn some of what it has absorbed before adding new stuff — and that that process is itself self-reinforcing. That’s one reason cognitive scientists see testing itself — or practice tests and quizzes — as a powerful tool of learning, rather than merely assessment. The process of retrieving an idea is not like pulling a book from a shelf; it seems to fundamentally alter the way the information is subsequently stored, making it far more accessible in the future. Dr. Roediger uses the analogy of the Heisenberg uncertainty principle in physics, which holds that the act of measuring a property of a particle (position, for example) reduces the accuracy with which you can know another property (momentum, for example): “Testing not only measures knowledge but changes it,” he says — and, happily, in the direction of more certainty, not less. Of course, one reason the thought of testing tightens people’s stomachs is that tests are so often hard. Paradoxically, it is just this difficulty that makes them such effective study tools, research suggests. The harder it is to remember something, the harder it is to later forget. This effect, which researchers call “desirable difficulty,” is evident in daily life. The name of the actor who played Linc in “The Mod Squad”? Francie’s brother in “A Tree Grows in Brooklyn”? The name of the co-discoverer, with Newton, of calculus? None of which is to suggest that these techniques — alternating study environments, mixing content, spacing study sessions, self-testing or all the above — will turn a grade-A slacker into a grade-A student. Motivation matters. So do impressing friends, making the hockey team and finding the nerve to text the cute student in social studies. But at the very least, the cognitive techniques give parents and students, young and old, something many did not have before: a study plan based on evidence, not schoolyard folk wisdom, or empty theorizing. An article on Tuesday about the effectiveness of various study habits described incorrectly the Heisenberg uncertainty principle in physics. The principle holds that the act of measuring one property of a particle (position, for example) reduces the accuracy with which you can know another property (momentum, for example) — not that the act of measuring a property of the particle alters that property.